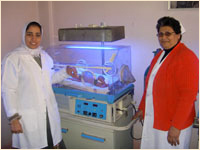 The American Hospital of Tanta was established over 100 years ago by two American Presbyterian female doctors. It provides outpatient and inpatient care and services to the residents of Tanta and neighboring towns within a fifty-mile radius. The hospital also offers specialized geriatric care, as well as social services to the neighboring communities. It operates with 350 full–time and 100 part-time employees, serving about 30,000 patients every year through its outpatient clinic. The hospital can accommodate 85 patients in addition to a 13 bed ICU/CCU and a dialysis unit serving 36 patients regularly. Although many positive changes and renovations have been made, the Tanta Hospital still needs some remodeling and additional facilities in order to improve and expand its service to meet the needs of the community.